In this Sgt. 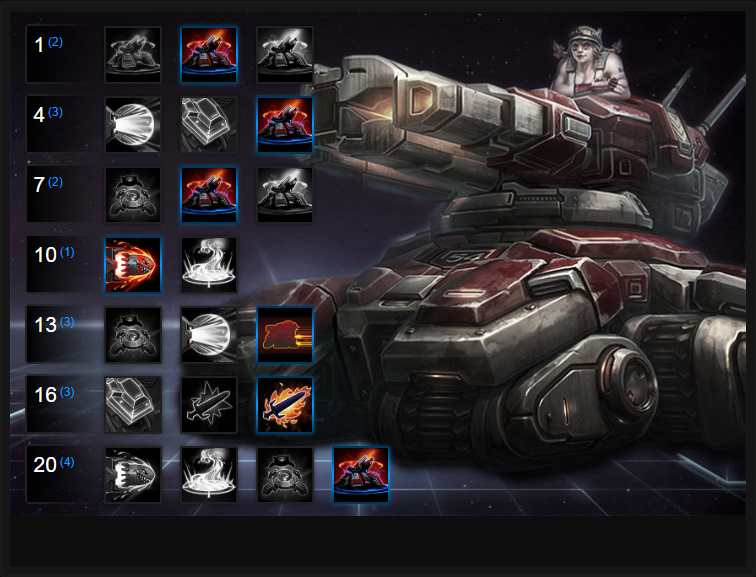 Hammer Build Guide, we provide an overview of her strengths, abilities and talents. Sgt. Hammer is a ranged Specialist. She has an incredible ability to push lanes due to her extended reach and if she has a front-line to protect her, she can deal huge amounts of damage to the enemy or their structures. Despite piloting a tank, she's surprisingly squishy and can die in seconds if focused. Despite that, the current meta where many teams choose two warriors or two support Heroes suits her very well. It allows Sgt. Hammer to have a solid front line, allowing her to continually deal damage from the back without too much fear of being attacked. What I will stress with Sgt. Hammer is that to be truly effective, your team should draft around you and ideally, you want to pick her as the last choice. Doing so not only ensures the enemy team won't have drafted to counter her, but it also means she has a solid front-line to body block for her. Siege Mode (Trait) – This is Hammer’s signature ability, and learning to use it properly is key to mastering the Hero. Your damage and range spike up significantly during Siege Mode, but you become unable to move while sieging. If you Siege too far away, you won’t be able to lay down the damage, but too close to enemies and you’ll be focused. Always have an escape plan before entering Siege mode, and try to choose safe areas. If you can, it's worth setting up your Siege only when you've your full team around you and remember - using Siege Mode only increases your range, splash damage and damage to minions/structures. Going Siege Mode just to attack enemy Heroes, when you could be a sitting duck, isn't a good thing. Siege Thrusters (Z) – With immobility being one of Hammer’s weaknesses, Siege Thrusters can come in handy fairly often. You can escape from ganks, or re-position yourself during team fights almost instantly. During laning phase, you’ll generally want to save your Thrusters to get out of bad situations, but you can use them more liberally in the mid-late game. Be aware that Siege Thrusters have a lengthy cooldown and will, regardless of whether you're in Siege Mode, instantly uproot you at full speed. Don't waste your Siege Thrusters to travel the map, use them for escaping instead. Spider Mines (Q) – Spider Mines have several key uses for Sgt. Hammer. By placing them down, they'll provide additional vision for you, allowing you to fire at enemies you might not have previously been able to see (which you can now attack). In addition, the mines will automatically track any enemies who come near you for a moderate amount of damage. While most Heroes can comfortably survive it, the 25% slow for 1.5 seconds is what you're really after as it grants Sgt. Hammer some time to escape (whether she simply drives away or uses her Siege Thrusters). Don't be afraid to use your Spider Mines to clear minion waves - they help soften them up. Concussive Blast (W) – This ability can, quite literally, be a life-saver, so save it for when you need it. It’s one of your few tools that you have to keep yourself alive when things get scary, and it’s important not to waste it. If a melee Hero is closing in on you, this can knock them away. It will also interrupt channels, so you’ll sometimes use it for that purpose as well. Of course, you’ll also be able to save a nearby teammate if they’re getting jumped on but try to ensure you save yourself. Never waste Concussive Blast. Neosteel Plating (E) – Allowing Sgt. Hammer to instantly gain 25 armor for 2 seconds, Neosteel Plating is all about mitigating incoming damage. Considering its value is doubled during Siege Mode, it affords Sgt. Hammer an incredible amount of defence. Only ever use Neosteel Plating when you're under direct and serious pressure. It's designed to buy your team time to protect you, or for you to survive long enough to kill and opponent and/or escape with Siege Thrusters. Blunt Force Gun (R)– The global range and large burst damage of Blunt Force Gun can make it an appealing choice. If you go for it, you’ll generally want to hold on to it during a team fight until a few enemies are low, then you can fire it off to snipe a couple kills. Just make sure to lead your target if you’re looking for a long-range kill, and account for the fact that you’ll be briefly stunned while firing. Considering the global range, it's an incredibly strong Heoric and can often clear several Heroes during a team fight. Napalm Strike (R) – Positioning correctly and using your abilities well are critical with Sgt. Hammer, but doing so while also utilizing Napalm Strike is what will truly test your skill. Casting Napalm Strike doesn’t interrupt your other abilities, or even your basic attack, which means you can use it while moving and weave it in between your other actions. When done properly, it can be a large boost to your overall damage output. The one downside to Napalm Strike is that it has a lesser range than your basic, meaning you won't be able to use it from maximum Siege Range - it falls short. I've often found Napalm Strike to be much stronger when out of Siege Mode so you can drive and drop it. Advanced Artillary allows Sgt. Hammer to deal increased splash damage when in Siege Mode, while also increasing splash radius by the same amount (25%). Considering the damage potential this affords Sgt. Hammer, especially against enemies who are grouped up, it allows her to clear waves quicker and pressure a group with much greater ease. Variable: Ambush provides Sgt. Hammer with a cloak right from the start. The main bonus is primarily on some of the more recent maps that are larger as it allows you to get into position early before protecting your allies. It also provides a damage boost to your opening attack. The damage increase of 100% to your basic attack is huge and offers amazing burst from cloak. Interestingly, Ambush can also save your life against certain Heroes who have no ground targetted attack. Regenerative Bio-Steel allows Sgt. Hammer to gain some sustain, granting her 10% healing based on her damage dealt when in Siege Mode. It doesn't sound a lot, but does ensure she can keep her health topped up from poke damage. Being able to move whilst in Siege Mode thanks to Hover Siege Mode, even if it is at 40% speed is a good boost to your survivability and mobility. It allows you to back away during a team fight, or creep forward as your team does. Offering high burst that's global, Blunt Force Gun can comfortably snipe any low health Heroes in an instant. Just be sure to lead with it (as there's a slight delay upon firing). With Sgt. Hammer remaining vulnerable to dive, Hyper Cooling Engines is a must. Reducing the cooldown of your Thrusters by 5 seconds when you land your basic attacks in Siege Mode, it ensures you've always got an "out" available. A simple but potent Talent, Giant Killer increases your basic attack damage by 1.5% based on the Heroe's maximum health. It's a solid damage bump, especially when in Siege Mode. Potent when fully capped, Ultra Capacitors grants Sgt. Hammer 5% bonus attack speed in Siege Mode when hitting an enemy Hero. Considering she can reach 40%, it allows her to absolutely melt opposing players - especially if she has a strong front-line. These Hero Threat Levels (1 being lowest threat and 10 being highest threat) are to help you determine which enemy Heroes can give you a headache. For the Heroes listed here, take extra care as they're particularly dangerous for Sgt. Hammer. E.T.C. : He can stun and push you back into the enemy lines, making life very difficult. Illidan: If he gets on you 1 v 1 and your "Z" is down you are dead. There's no escaping Illidan. Jaina: Her slow and burst can be a headache as you've no reliable means of escape if you "Z" is down. Kael'thas: Stay out of his burst and you will be fine. If you eat his full rotation however, you'll die. Kerrigan: 1 v 1 she will win and she's mobile enough to chase you down. Murky: His Slime, plus Pufferfish and the fact he can make himself immune make Murky a challenging Hero. Nova: Not much threat until level 16 but if she catches you medium health or less, she'll blow you up instantly. Zeratul: Hard to escape from and his burst is superb. You'll struggle to see him coming. Thrall: His root combined with his Windfury burst can absolutely destroy you. If he's late game, his tripple damage on the final blow is a one-shot kill. Many Thrall's will counter you hard with Sundering. The Butcher: If he has taken Lamb to the Slaughter, you're a free kill every time. Even without it, he can still destroy you if you don't have your "Z" available. This list of tips and tricks are just a handful of things we think will help your Sgt. Hammer play. We'll continue to add to the list as required and if you have any tips you'd like to share, let us know in the comments below and we'll place them here. 1. Push, push, push. It's what you are best at and be sure to do it as often as possible. 2. You do NOT have to use Siege Mode against enemy Heroes. It does no extra damage but will, obviously, allow you to attack them from further away. 3. Sgt. Hammer typically out-ranges most Heroes when she's in Siege Mode. Use this to your advantage in team fights. 4. If you take it, use Barricade to stop fleeing enemies, give yourself room to escape or to split the enemy in a team fight. 5. Be sure to setup early when an objective appears so that you can get into position. 6. If you don't have your Thrusters available, I'd recommend you avoid Siege Mode until it comes off cooldown. It can leave you too vulnerable. 7. Always try to use Blunt Force Gun against low health targets. It'll finish them off and anyone who's reasonable on health, will have a serious chunk taken off. 8. On large Battlegrounds, and where you need to interact with an objective, take always Graduating Range. You should have enough time to get into position and give yourself maximum range to cover it. 9. Be sure you don't miss with Concussive Blast. If you do, you'll be in big trouble. 10. If the enemy team has a Butcher or Illidan, just be sure to use your Mines and Concussive Blast the moment they can take damage.